Since Harrisonburg Downtown Renaissance was formed 12 years ago, one of its goals has been a hotel and conference center in the city’s urban core. 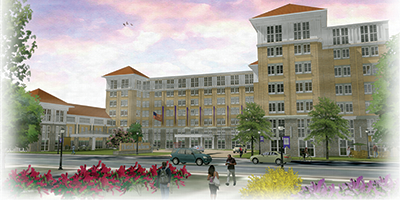 This year, construction will start on a hotel with 205 to 225 rooms and a conference center with 20,000 to 22,000 square feet of meeting space that will sit on property owned by James Madison University. The public-private partnership deal wouldn’t have been possible without JMU’s land and financial input, says the project’s developer, Paul Gladd. “JMU’s contribution of the land helps the economics work from an underwriting standpoint,” says Gladd, a principal of Gaithersburg, Md.-based dpM Partners. A key ingredient of the plan was the city of Harrisonburg linking up with the JMU Foundation to provide a quarter of the $40 million needed to build the project ($10 million for the conference center). The rest of the money will be privately financed by the developer. 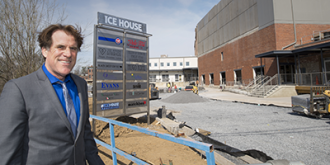 When completed, the complex also will house the university’s hospitality management program. “It definitely reduces the risk of providing financing,” Gladd says of JMU’s involvement. The project, to be named Hotel Madison and Shenandoah Valley Conference Center, is one of the more recent, striking examples of the economic reach of JMU. The university has helped in the development of business ventures ranging from a small bakery in Augusta County to a research campus in Harrisonburg. JMU’s approach to science and technology instruction has made Harrisonburg, Rockingham County and other areas of the Shenandoah a magnet for specialized industries. And the university’s schools have turned out graduates who’ve launched innovative companies that orbit JMU’s 148 buildings. Gladd’s hotel and conference center is expected to host events for a variety of associations, many of them involving JMU’s professors. Harrisonburg Downtown Renaissance believes the development has the potential to pull in new visitors. The project is expected to generate $1 million per year in taxes from a property that had been exempt from local levies. The partnership calls for the city to pay the JMU Foundation back for its $10 million investment, then keep the lodging and other taxes from the development. The hotel and conference center complex is just one manifestation of the growing economic influence of the university. When JMU completed its last economic impact study, the school estimated that it was responsible for $10 million in combined tax revenues for Harrisonburg and surrounding Rockingham County, says Brian Shull, Harrisonburg’s director of economic development. At that time, 2008-09, the university had a $395 million budget. The school’s yearly operating budget has since gone to $500 million, meaning the corresponding figure in local tax revenues has gone up to about $13 million, Shull says. The university’s contribution to economic development isn’t as easily calculated. Shull credits JMU’s business education and study programs with attracting and initiating businesses in the region. “The areas of study that they specialize in help other businesses in the community,” he says. Along with the business school, the College of Integrated Science and Engineering also has helped spur the development of research-based firms in central Shenandoah Valley. One of the best known companies in Harrisonburg is Rosetta Stone, a tech-based language-learning company that now has its headquarters in Arlington. Started in Harrisonburg in 1992, its operations eventually settled in a converted agriculture warehouse downtown, where it still employs hundreds. Another company, Serco, an international contractor of information technology and professional services, employs dozens of specialists in Harrisonburg who research trademark applications for the federal government. The university is active in regional efforts to recruit business and industry. A partnership with JMU was crucial in SRI International’s decision to build a 40,000-square-foot biosciences center in Harrisonburg. Its research areas include infectious diseases and drug development. “We were involved in the initial discussion of connecting our faculty with their research,” says Ken Newbold, JMU’s associate vice provost for research and scholarship. The involvement was part of the university’s team-based approach to regional economic development, he says. The university also provides offices for the Shenandoah Valley Partnership, an economic development marketing organization serving seven counties and five cities, and the Shenandoah Valley Technology Council, a regional network and business development partnership for technology users and creators. Last year, the university launched the Madison Center for Community Development, a program that links faculty with local governments for help with planning, economic development, grants, training and other tasks. “JMU has always taken a partnership and collaborative approach to economic development in the area,” Newbold says. JMU’s assistance extends to small business ventures. Two years ago, Augusta County residents Jack and Mary Wilson asked business professor Marshall Pattie to assist them in reviving an iconic bakery and diner that had closed in the Churchville area west of Staunton. Pattie enlisted three of his business school seniors to help with research and consulting to bring back what had been White Way Lunch, named for a family who had owned the business for generations. The Wilsons expect to reopen the business this year as White’s Wayside Diner, selling bread made the same way the family had. The College of Business also has for a quarter of a century hosted the Shenandoah Valley Small Business Development Center, part of a state network of offices that provide advice, training and resources for companies with fewer than 50 employees, says director Joyce Krech. Most recently, the valley SBDC helped a woman start The Ice Cream Truck in Page County, where she provides the area’s only mobile food vending operation of any sort. In a southern part of rural Rockingham County, Eastern Bioplastics got planning help from the SBDC staff as the company developed a process for converting poultry feathers into fibers. People in the region with big dreams and marketable ideas have a free resource available at the university: Mary Lou Bourne. She runs the university’s Office of Technology Transfer, which helps turn technology created by JMU faculty and students into businesses. The office helped hatch Madison Assessments LLC, a testing firm. It helps colleges and universities determine how much of their instruction sticks with their students. Bourne also heads the affiliated James Madison Innovations, which provides licensing and intellectual property management for innovations not developed by the university, in exchange for a small ownership stake. Madison Innovations also partners with the school’s Center for Entrepreneurship in a program based in downtown Harrisonburg called ICE@JMU. It provides expertise, resources and collaborative space for entrepreneurs. As much as the university presence has contributed in programs, money and construction, one of the most important drivers of business from JMU has been people — educated individuals with energy and ideas. JMU’s student population has grown by a third since 2000 to about 21,000 undergraduate and graduate students. Shull, who has been in his position for 17 years, said students provide a growing customer base for businesses and a reliable source of workers. “Just the vibrancy that a university brings to a community is amazing,” he says. The lifestyle offered by a college town in the middle of the scenic Shenandoah Valley entices many graduates to stay. Developer Barry Kelley knows all about it. He partly credits the presence of JMU for the success of his real estate firm, Matchbox Realty. It has developed several downtown commercial and residential properties for people seeking a walkable, urban lifestyle blocks from the university. Matchbox is repurposing the Cassco Ice House into a mixed-use building that houses ICE@JMU along with apartments. “Not that we don’t have an existing [urban] community, but certainly to allow this to grow to the magnitude that it has, it’s been in large part due to the JMU community,” Kelley says. He recently won an award for Matchbox’s downtown development projects. Like Shull, Kelley notes that, among JMU graduates, a percentage of them —young, educated and highly motivated — look to start their lives in and around the town where they earned their college degrees. One of them is Kelley, who graduated from JMU in 1983, got married and made a life for himself near his alma mater.